ROANOKE, Va. (June 3, 2017) -- The Taubman Museum of Art is pleased to announce the 59th Annual Sidewalk Art Show award winners. This year’s judge, Adam Justice, assistant curator of modern and contemporary art at the Mint Museum in Charlotte, N.C., selected the winners. ROANOKE, Va. (May 12, 2017) – The Taubman Museum of Art is pleased to announce the 59th Annual Sidewalk Art Show June 3-4 in downtown Roanoke. The show runs 10 a.m.–5 p.m. each day. 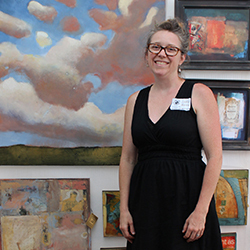 The annual event, which occurs the weekend after Memorial Day on the streets surrounding the Taubman, is a premier destination for fine art shopping that offers visitors the opportunity to meet and talk with exhibiting artists. 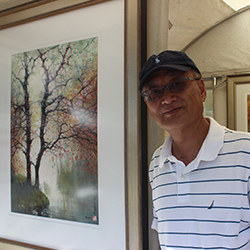 This year, more than 100 artists from across the country will display and sell original artwork including paintings, prints, watercolors, etchings, mixed media, fine art photographs, fine crafts and sculpture. The event will feature artists from as far away as California and Canada, with a strong representation of local and regional artists who are known and loved in the community. ROANOKE, Va. (April 5, 2017) - Part rally, part performance, and part auction, the Taubman Museum of Art's third annual Monster Art Rally Thursday, April 20, is a fun night out to discover talented local artists in Virginia's Blue Ridge. The event is free and open to the public. 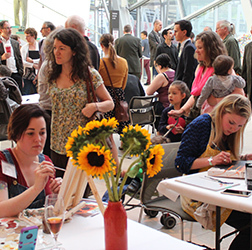 More than 30 artists will gather at the Museum to create original drawings as guests watch. Guests can get a close-up look at the artists’ creative process and learn more about what inspires their work. At the end of the evening, all of the works will be put up for auction for only $50 each. The work goes to the "bidder" who draws the highest card from a deck of cards. ROANOKE, Va. (March 8, 2017) — Everything's coming up roses (and peonies and sweet peas!) 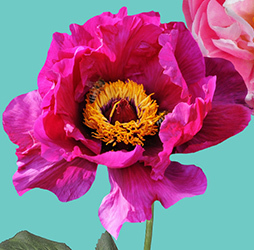 at the Taubman Museum of Art this spring with Art Go Bloom, a special four-day fundraiser featuring an exhibition of fresh floral arrangements inspired by works on view in the galleries. Expert gardeners and floral designers from the Roanoke Council of Garden Clubs will create and display one-of-a-kind floral creations that reflect the beauty and creativity of 20 works of art on view. Participating garden clubs include Designer’s Atelier, Hunting Hills Garden Club, Mill Mountain Garden Club, Roanoke Valley Garden Club, Sugarloaf Garden Club and Westchester Garden Club. 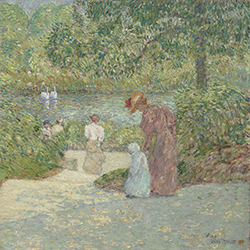 ROANOKE, Va. (Feb. 1, 2017) — The Taubman Museum of Art is pleased to present American Impressionism in the Garden, a special ticketed exhibition featuring significant paintings and sculptures by renowned American artists who celebrated gardens as a compelling subject during an era of vibrant gardening culture. On view for the first time together, these works by artists such as John Singer Sargent and Frederick Childe Hassam explore the tremendous impact of the Impressionist art movement (1880-1910) on American artists at the turn of the 19th century. The exhibition is on view Feb. 19-May 14, 2017, with a member preview day Feb. 18. Tickets are available at TaubmanMuseum.org/Impressionism or by calling 540.342.5760. Member tickets are free. For those who are not members, exhibition tickets for adults (18 and older) are $8; college students and seniors (65 and older) are $6; and youth (17 and under) are free.